Do you did it? God, its amazing sweetie! Your style is so clean and I luv it! Good job! 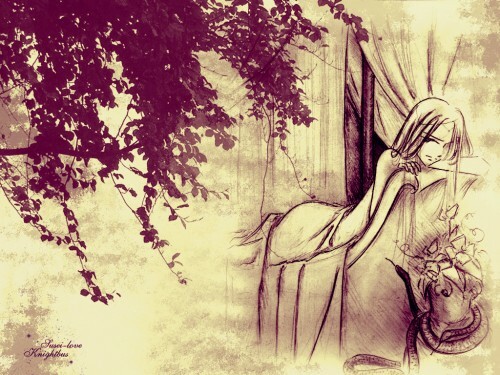 splendid, as MapleRose said, the colors and the sketch style is remarkable, I'm in love with the scene, the girl staring the snake, so calm, so attracting. and about the foliage I dont know but I found it perfect as the way it is, the scenery is soo small that the color of the leaves is actually helping to make it more outstanding. I'm hoping to see more of your original artworks. really like the design and composition which makes this wallpaper really beautiful ! the drawing you have added to the wall is nicely done and is elegant, gives bit theme from renaissance or then some kind of antiquity ^_^ wrinkles on the curtains are natural looking and details on the drawing are neatly done. 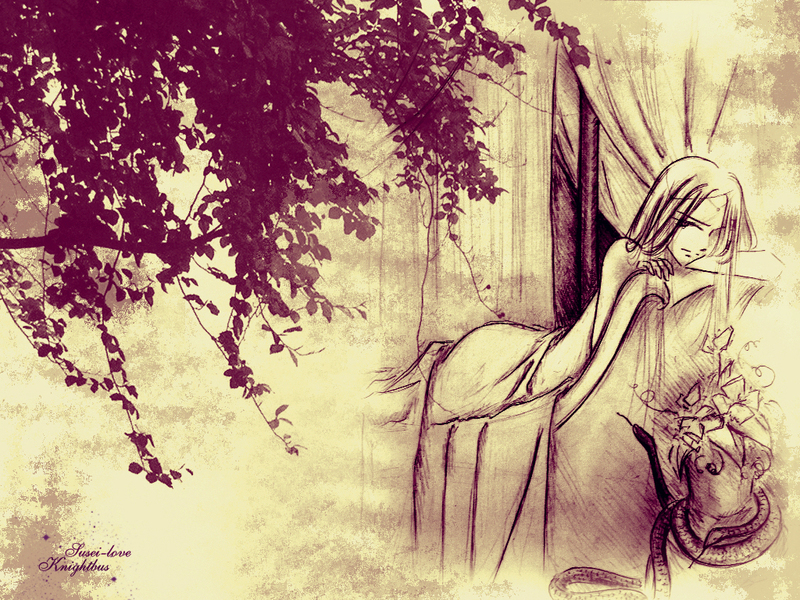 the snake around the flower pot looking at the lady which leans for the backrest of the divan looks gives touch of dancer and threat ~ it kind of is breaking the peaceful and calm atmosphere by giving tension. tree on the left side is very detailed too since the leaves and even the thin branches can be seen clearly. it fills nicely the left side on the picture and the way it reaches little over the middle of the pic gives nicely balance since the drawing fills the right side. colours are well choosed, bit purplish red is bright and fits prettily with the creamy yellow. creamy yellow colour balances the bright red but not too much and it also gives the touch of oldness. patterning around the picture emphasizes the old-fashionesd style and design on the picture and making it fascinating :) overall wonderful work ! I love how you've managed to get the colors to meld into eachother. And how natural it looks. One question : is that a male or a female ?... the character somehow has an androgynous face, even though my "male instinct" (lol) tells me it's a 'she' ^_^'. Anyway, i'm not even sure whether the foliage was necessary, given the awesome work you've done with the character and other elements of the work. There is a real 'life' emanating from this work, like you could enter it anytime. The eyes are actually very pretty!